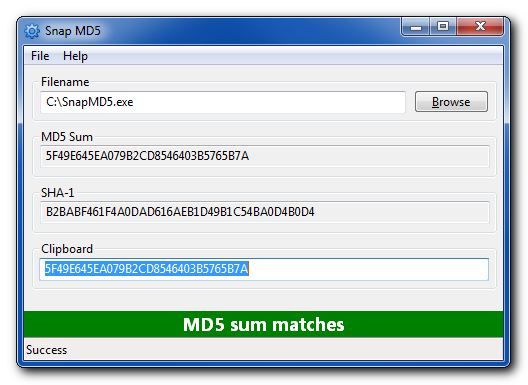 Snap MD5 is a simple utility to validate the MD5 sum of downloaded files. It requires no installation and is completely portable, meaning it doesn't read or write to the registry and doesn't require any configuration. To use it, copy the MD5 sum from the web site, then when the file has downloaded, run Snap MD5 and browse to the downloaded file. It will tell you if the file is valid or not. Works on all versions of Windows, 32 and 64-bit and supports unicode characters in the filename. Snap MD5 is freeware and can be used for private or commercial use. Never take life seriously, nobody gets out alive anyway.